Is the Reagan family still upholding law and order in the Big Apple? Has the Blue Bloods TV show been cancelled or renewed for a ninth season on CBS? The television vulture is watching all the latest TV cancellation and renewal news, so this page is the place to track the status of Blue Bloods, season nine. Bookmark it, or subscribe for the latest updates. Remember, the television vulture is watching your shows. Are you? Airing on the CBS television network, Blue Bloods stars Tom Selleck, Donnie Wahlberg, Bridget Moynahan, Will Estes, Len Cariou, Marisa Ramirez, Sami Gayle, and Vanessa Ray. The police procedural centers on the Irish-American Reagans, a multi-generational family of cops dedicated to New York City law enforcement. New York Police Commissioner Frank Reagan (Selleck) leads both the police force and his brood. The eighth season of Blue Bloods averaged a 0.91 rating in the 18-49 demographic and 9.08 million viewers. Compared to season seven, that’s down by 27% and down by 14%, respectively. Find out how Blue Bloods stacks up against the other CBS TV shows. Blue Bloods has been renewed for a ninth season which will debut on September 28, 2018. Stay tuned for further updates. 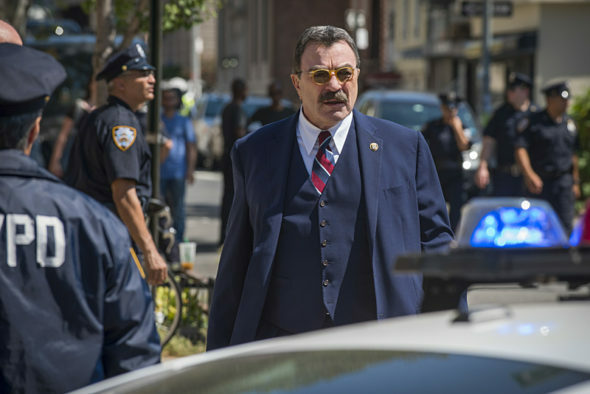 Will CBS cancel or renew Blue Bloods for season nine? This Friday night staple has been on the bubble each year. With the current year-to-year ratings declines, I think this could be the year that the Reagan family says goodbye but it probably will survive. I’ll keep an eye on the Nielsens and will update this page with breaking developments. Subscribe for free updates on any Blue Bloods cancellation or renewal news. 4/18/18 update: CBS has renewed Blue Bloods for a ninth season. Details here. TV show ratings are still important. Follow Blue Bloods‘ weekly ups and downs. Find more Blue Bloods TV series news or other CBS TV show news. What do you think? Are you glad that the Blue Bloods TV show was renewed for a ninth season? How would you feel if CBS had cancelled this TV series, instead? I love the show and watch the new and reruns a lot. Everyone will be very disappointed if it should go off. Why would it unless something silly would get in the way and all those people would lose their jobs for no good reason. I hope no one is being selfish. Sometimes someone thinks they deserve more money or is unreasonable. If it is cancelled someone better have a really good reason and not some stupid excuse. Vickie Bynum Please don’t ever cancel bloodbloods. I love the show and so many more do. We missed it last week. Of all the programs on ANY network, BLUE BLOODS is perhaps the BEST…sharing: MORALS, FAMILY, dealing with “ISSUES”…something that AMERICA would be blessed, if more lived as this family does….no GOOD TWO SHOES….just pure INTEGRITY and LOYALTY and LOVE…and…well, watch it, if you haven’t!! then YOU decide!! I love Blue Bloods do wish they could have had an episode or so that showed Frank’s wife and his oldest son Joe. Thats how much I get into the show. Love love love blue bloods, never miss a show. Please keep on showing . What happened to Week End Blue Bloods? Now this Lame Show NCIS-New Orleans is on instead??? Why would I want to watch anything that has to do with the Bayou Death Capitol of the Nation that is Plagued with Drugs Debauchery and Killings Galore in real life?. Bring Back Week End Blue Bloods!!! The Following Show ” Madam Secretary ” was a Good Choice Change.